Here is another giveaway for you from one of my new found blogs...freebies, what is there not to just love? Besides the freebies, Rebecca is also a WAHM and the owner of Quote The Walls, check her out when you get a chance. 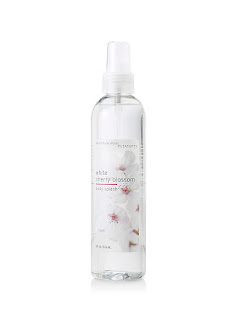 Visit Fun and Free Giveaways for a chance to win a bottle of White Cherry Blossom body spray from Bath and Body Works.....my favorite place. I recently had a "custom keychain giveaway"...Amy and I worked together to come up with something that was similar to the "Tagged" keychain, but personalized with what her children call her, "Mama". I wanted to share "Mama's Blessings" with you...I just love how this turned out. It will be available for purchase on my website later this week. Thanks again Amy for entering the contest and congratulations on your win! OK...so my boys both love BOB. This show has been playing in my house for years and I am so tired of all the DVD's that we have. I have TIVO so I even record them each day...but it's getting old seeing the same ones over and over and over and over and over. Here is a giveaway for all of you that have little "Bob" fans. 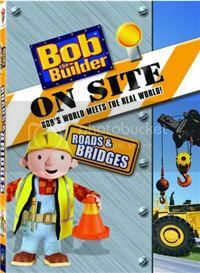 Visit http://islandreview.blogspot.com/2008/02/review-bob-builder-on-site-roads.html to enter. You have until February 25 to leave a comment on An Island Review and a random winner will be chosen on the 26th. 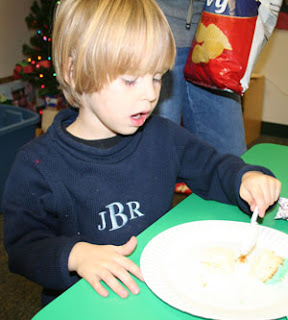 Win a set of 5 personalized place mats courtesy of Olive Kids! Winner can choose from boy or girl set. Ready to win? Visit http://momsloveshopping.com/personalized-place-mat-contest-from-olive-kids/ and leave a comment to be entered for a chance to win. Contest ends Friday February 22, 2008. Winner will be chosen randomly from all entries. I can't belive it's already the middle of February...Valentine's Day is over, spring break is coming, and then it's time for the Easter bunny! This year is flying by! I just wanted to share my newest polymer clay bracelet...just in time for Easter. It's made with a small polymer clay bunny bead, white cats eye beads, and pink/green czech glass beads. It's strung on professional multistrand jewelry wire and secured with a sterling silver trigger clasp. As always, a grow chain is recommended to accommodate your growing little girl. I only have a limited number of these...so when they're gone, they're gone. Valentine's Day Giveaway WINNERS announced! Winners were announced today for the Valentine's Day Giveaway on mymommysbracelets.com. If you entered you should have received an email from me. Thank you to all who entered, it was a HUGE success. If you didn't win this time *and even if you did* please be on the lookout for my next giveaway...plans are already in the works! AMYWALCH! Congratulations! 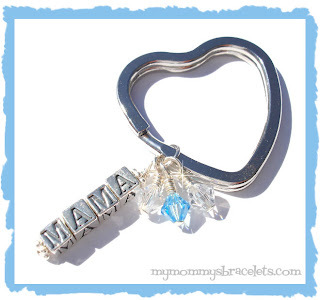 You are the winner of the mymommysbracelets.com custom keychain giveaway. Please email me within 7 days to claim your prize. Thank you to all who commented...be on the lookout for the next giveaway.....it's coming soon! There is nothing cuter than seeing a Mommy and her daughter wearing matching bracelet sets. 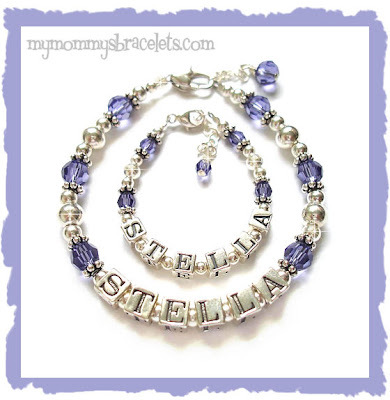 mymommysbracelets.com offers several Mother/Daughter bracelet sets to choose from. 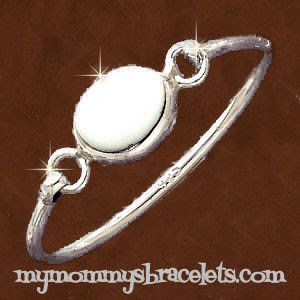 The set that is pictured is new...it was designed after the ever popular "Cole" Mommy Bracelet. These bracelet sets make great gifts for any Mother and Daughter or even a Grandmother and Granddaughter. Just remember that Mothers Day is right around the corner and it will be here before you know it! Imagine the look on her face when she opens one of these! If you don't see the "perfect" bracelet set please email me and we can create something that she will treasure. I came across this contest and wanted to share! My Little Monky Boutique is giving away ONE FREE monogrammed sweater available in sizes 0-12 months, 2T and 3T. This monogrammed sweater is available for boys and girls in my online boutique at MyLittleMonkeyBoutique.com. The sweaters are available in navy blue, pink or natural color. The monogrammed letters can be stitched in a variety of colors and styles. You can choose between having your child's initials, a single letter, or his/her name up to six letters. And voila, you are entered! The winner will be announced Friday, Feb. 8th. Good luck! Here is the giveaway I have promised you! I am giving away one "design your own" keychain! -any comments/suggestions receive "extra credit"
Well, I feel alot better today. Thankfully my flu bug didn't stick around as long as I thought it would. My son is still pretty sick, going on 6 days now for him, he is weak, won't eat or drink much, still running a fever (low grade now), and is pretty congested. His asthma started flaring up last night, but we got it under control pretty quick. So...hopefully he will start feeling better soon too. He has missed school all week so far and is upset about it. He wants "perfect attendance" like he has had so far this year, until now. He even got a certificate along with a prize for not missing any school......then this happened. So, since he still feels bad it's off to the doctor today if he can't shake it by lunchtime. HARD! I am so sick...high fever, chills, sweaty, headache, congested...you name it. So...this is a quick post because I am off to bed again. Just wanted to apologize for not having a giveaway...guess later this week I will have to do a super duper one huh? My 5 year old is sick...yep, tis the season for...the dreaded flu. Despite getting a flu shot he still got sick. He has asthma and is on daily steroids making his immune system a little weak. So...Friday I had to pick him up from school and deal with fevers reaching over 104, not fun. Today he is starting to feel a little better, but continues to have a low grade fever of 100.6. I think he is staying home tomorrow, but we will see...he LOVES school and doesn't want to stay home. BUT...now I don't feel good...so I took the day off. I didn't do a thing, well, I did have to scrape hair gel out of my 2 year olds hair. And had to pick crayons out of his mouth. And chase after him to get him to keep his diaper on.......other than that I did nothing. Tomorrow is another day...and hopefully I will feel better. There is not time for me to be sick. I will also be giving away something...not sure what, but I am sure you will like it. Something new to mymommysbracelets.com...a line of sterling silver engravable jewelry. I am so excited about this...each and every item is GORGEOUS (yep, I already own several pieces)! I am still adding new items in adult and childrens sizes. I will have bracelets, earrings, pendants, necklaces, and sets. This particular bracelet is available in childrens sizes 5" and 6" and adult sizes 7" and 8". The middle disc is available in either a heart, oval, round, or square shape. The style of engraving is totally up to you...either block or script...an initial, 3 letter monogram, or a name. It may still be winter but spring and Easter are just around the corner! And while you may not want to hunt Easter eggs outside in the cold and snow, you will want to play the Bullfrogs and Butterflies Boutique Easter Egg Hunt for a chance to win a FREE Easter themed jon jon romper. It is easy to play. All you have to do is visit http://www.bullfrogsandbutterfliesboutique.com and hunt for the Easter egg (picture is located here: http://bullfrogsandbutterfliesboutique.com/fpdb/images/egg.jpg ). Once you find it, click on it and you will be taken to the contest's rules & registration page where you can register to WIN!. It's that easy and you could win a FREE Easter themed jon jon romper just for playing along. Hurry and play as the contest ends at midnight CST on February 10, 2008. Several winners will be selected and will be notified on February 11, 2008.